First off: my apologies for the lack of appropriate Spanish letters in this review. I have not yet figured out how to enter accents or tilde-n characters here, but I'm working on it. A number of good sodas come from Mexico. Aside from Jarritos, which can be amusing, there is also Mexican-bottled Coca-Cola (made with cane sugar, and definitely better than the domestically-bottled version--we'll have to do a full WSR head-to-head soon), and the one I'm reviewing tonight--Sangria Senorial (the i in Sangria should be accented, and the n in Senorial should have a tilde). For those who might not know, Sangria is a red wine/fruit juice concoction, and it's pretty tasty. 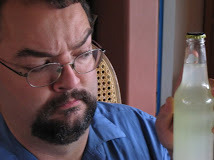 This is supposed to be the carbonated, non-alcoholic version. It's not all that uncommon, so I'm not sure it qualifies as Weird. I can't do a Vaguely Odd Soda Review, though, so let's settle on Weirdesque. Scent: complex. Sweet and deep, with something kind of like tannin, but not sour. Heady, fruity, maybe apple or cherry. Taste: Strong fruit, grape and cherry, without much acid. What bite there is is from the acid in the fruit, not the soda water. I note that the ingradients list does not have phosphoric acid (although it does have citric acid). Very sweet, but not cloying. It doesnt taste like wine, but it's not utterly unlike it. Neither is it utterly unlike a number of other things, such as Kombucha Wonder Drink, but "utterly" is too strong a word. It's more like wine than it is like cheese or moon rocks, for instance, but less like wine than it is like a black cherry soda. I think what I'm trying to say is that it's got a strong fruitiness, with some complexity and depth, but it doesnt actually taste quite like sangria. It's pretty nice, although I'm liking it slightly less the more I drink. The sweetness is increasing, and it's not too far from cloying now. Still tasty, and goes down easily due to lack of acid (which, oddly, would make it more like sangria), but I wouldn't want a whole lot of it. Aftertaste is slightly tart, but mild and pleasant. I think it's worth noting that this is the first soda, Weird or otherwise, I have ever had which lists iron on its nutritional information (and apparently supplies 2% of my daily supply at that). It also has measurable calcium. I have no idea where those come from; meat, spinach, broccoli, milk, cheese, and yogurt are not on the ingredients list. Quaff rating: 3 and a half. Would be a 4 except for the slight excessive sweetness with repeated exposure. Cough rating: 1. Nothing offensive here. I just had one of these. Pretty tasty. reminds me of my trips to mexico and quatamala. I tried this drink for the first time and really enjoyed it. Being a chef, I tried it in one of my cake recipes--strawberry to be exact--and it was a hit! Since it was purchased in Orlando, FL and I reside in Clearwater, FL, I'm now on the search for more locally. Even though it's not quite like wine, there is a similar taste, and I like that. I can drink it and feel like I'm having a glass of wine without getting drunk. It taste really good, and it's super cheap. It's only 1.07 for a big bottle, that makes quite a few glasses. Mixed with rum and a big chunk of lemon or sour orange it makes a great cocktail. Sangria Senorial also tastes vaguely like Italian Chinotto soda, but it's missing that bitter back taste. Chinotto is even sweeter, I think. Hey I'm from Vista, too! If you really like it, it is actually cheaper at the Wal-Mart off of University (Sycamore) in the Hispanic Foods section! I love this drink, i'm drinking one right now. Cheers! FYI - Sangria comes from Spain, not Mexico. Yeah but Sangria Senorial comes from Mexico. The review is on Sangria Senorial, not Sangria. If you got to there website it stated clearly it was created in Mexico. Who cares it really good. the fruit in señorial is wine grapes and essence of lemon. it is actually fermented, but the alcohol is removed after the process. most people i know drink it over ice, like sangria. Maybe I got a strange bottle, but it didn't taste sweet at all to me and had an overwhelming apple cider vinegar taste to it... eh. I won't buy it again. This is probably my favorite soda. I absolutely love this drink! It's sometimes difficult to find at my local store - seems to vanish, then appear, then vanish again or I'll run across it accidentally at other stores. But maybe that makes it more exciting! When I find some, I buy 5-6 bottles. Great for summer, tastes like a sweet wine, but non-alcoholic. A complex, fruity flavor. I don't find it overly sweet, just about right. Will experiment this summer mixing it with other drinks or in a recipe, as a chef suggested, maybe in a cake or other dessert. I was a life long COCA COLA drinker ( I am 70 ) ...recently Coke has destroyed their formulation, so subsequently, I have been experimenting. The sangria is EXCELLENT and reminds me of how DR. PEPPER tasted in the 1960s when supplied in GLASS bottles. I get my Sangria from Sav-A-Lot at $1 for a large bottle. I was hoping to read if any analysis had been done on the water used. Hopefully its free of anything terribly toxic. WSR has an official Mysterious Stranger! Welcome to Weird Soda Review!